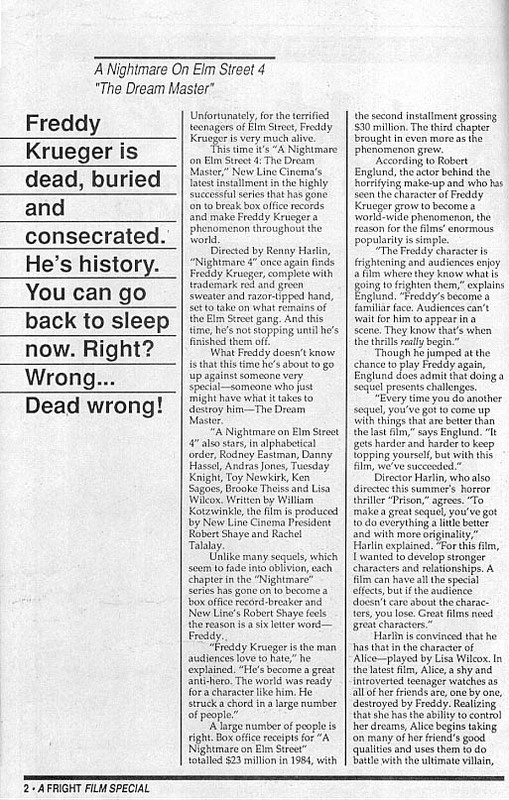 Freddy Krueger is dead, buried and consecrated. He’s history. You can go back to sleep now. Right? Wrong… Dead wrong! Published in Fright, Issue 3. Unfortunately, for the terrified teenagers of Elm Street, Freddy Krueger is very much alive. 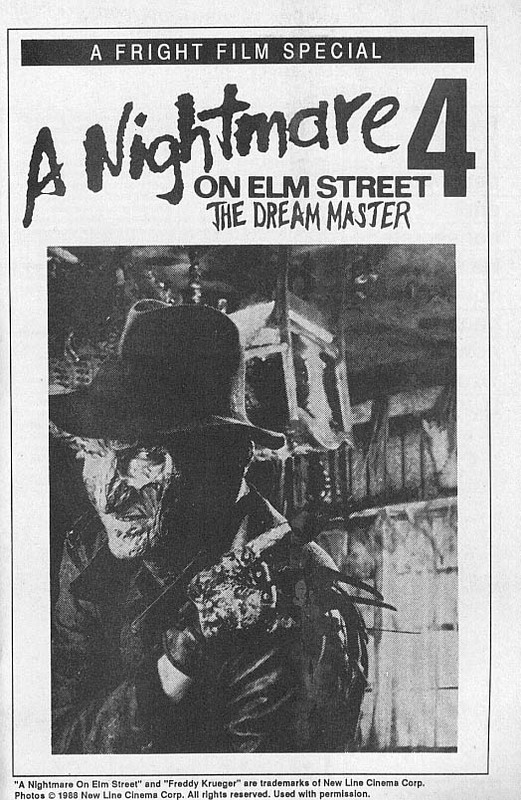 This time it’s “A Nightmare on Elm Street 4: The Dream Master,” New Line Cinema’s latest installment in the highly successful series that has gone on to break box office records and make Freddy Krueger a phenomenon throughout the world. Directed by Renny Harlin, “Nightmare 4” once again finds Freddy Krueger, complete with trademark red and green sweater and razor-tipped hand, set to take on what remains of the Elm Street gang. And this time, he’s not stopping until he’s finished them off. What Freddy doesn’t know is that this time he’s about to go up against someone very special—someone who just might have what it takes to destroy him—The Dream Master. 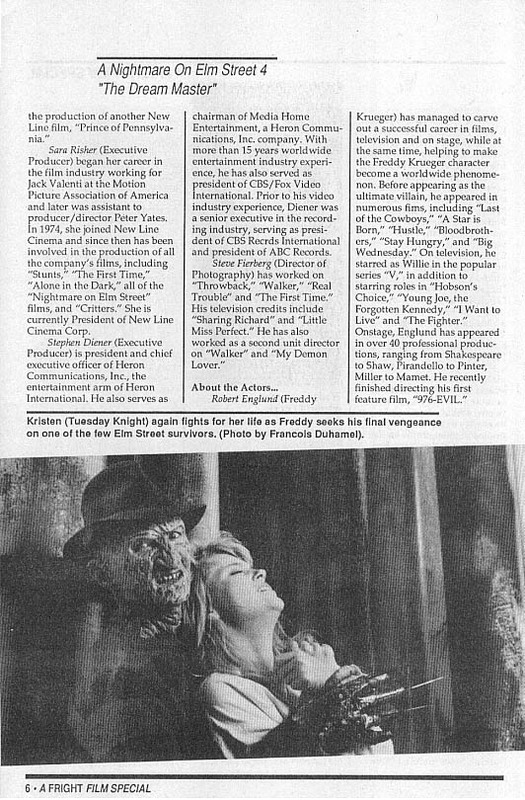 “A Nightmare on Elm Street 4” also stars, in alphabetical order, Rodney Eastman, Danny Hassel, Andras Jones, Tuesday Knight, Toy Newkirk, Ken Sagoes, Brooke Theiss and Lisa Wilcox. Written by William Kotzwinkle, the film is produced by New Line Cinema President Robert Shaye and Rachel Talalay. 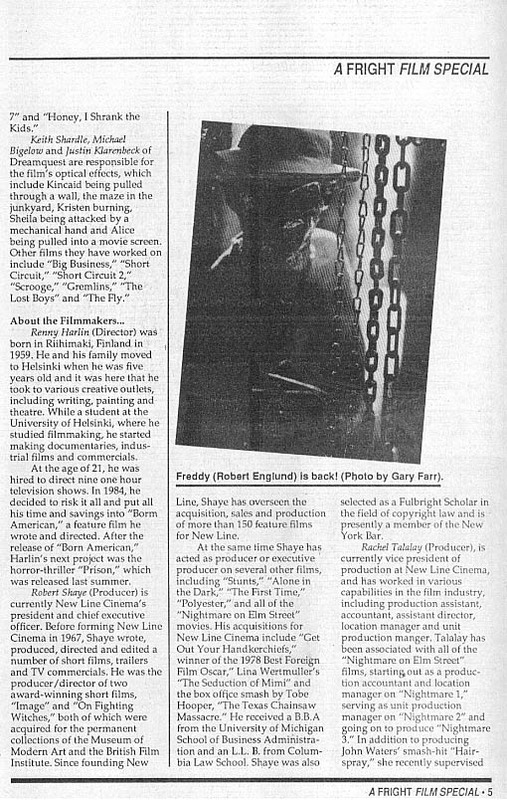 Unlike many sequels, which seem to fade into oblivion, each chapter in the “Nightmare” series has gone on to become a box office record-breaker and New Line’s Robert Shaye feels the reason is a six letter word Freddy. 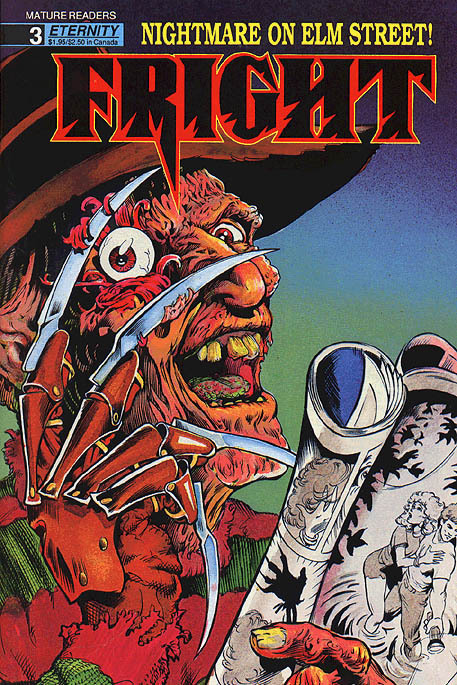 “Freddy Krueger is the man audiences love to hate,” he explained. “He’s become a great anti-hero. The world was ready for a character like him. He struck a chord in a large number of people.” A large number of people is right. Box office receipts for “A Nightmare on Elm Street” totaled $23 million in 1984, with the second installment grossing $30 million. The third chapter brought in even more as the phenomenon grew. Harlin is convinced that he has that in the character of Alice—played by Lisa Wilcox. In the latest film, Alice, a shy and introverted teenager watches as all of her friends are, one by one, destroyed by Freddy. Realizing that she has the ability to control her dreams, Alice begins taking on many of her friend’s good qualities and uses them to do battle with the ultimate villain, Freddy Krueger. Principal photography on “Nightmare 4” began April 27 in Los Angeles. In addition to locations throughout the city, which include an auto junkyard, a graveyard and a specially-built Elm Street house, many of the film’s interiors, special effects and stunts are being filmed on stages in Valencia, north of Los Angeles. Production designers Mick Strawn and his sister C.J. 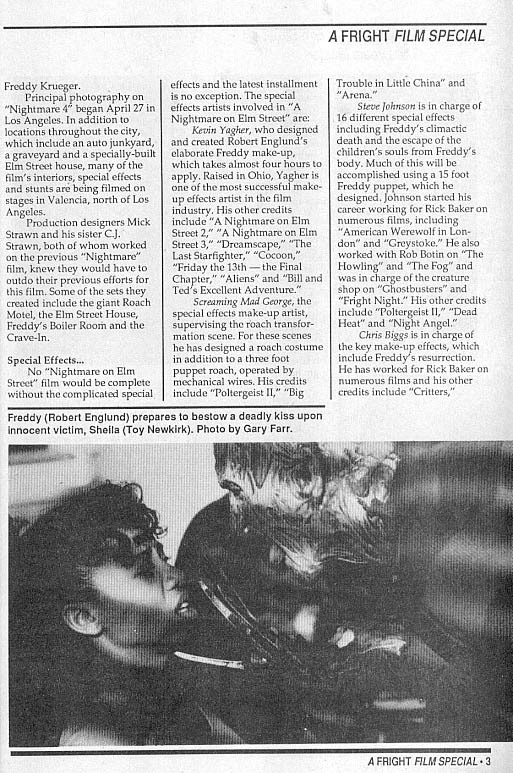 Strawn, both of whom worked on the previous “Nightmare” film, knew they would have to outdo their previous efforts for this film. Some of the sets they created include the giant Roach Motel, the Elm Street House, Freddy’s Boiler Room and the Crave-Inn. Renny Harlin (Director) was born in Riihimaki, Finland in 1959. He and his family moved to Helsinki when he was five years old and it was here that he took to various creative outlets, including writing, painting and theatre. While a student at the University of Helsinki, where he studied filmmaking, he started making documentaries, industrial films and commercials. At the age of 21, he was hired to direct nine one hour television shows. In 1984, he decided to risk it all and put all his time and savings into “Born American,” a feature film he wrote and directed. After the release of “Born American,” Harlin’s next project was the horror-thriller “Prison,” which was released last summer. Robert Shaye (Producer) is currently New Line Cinema’s president and chief executive officer. 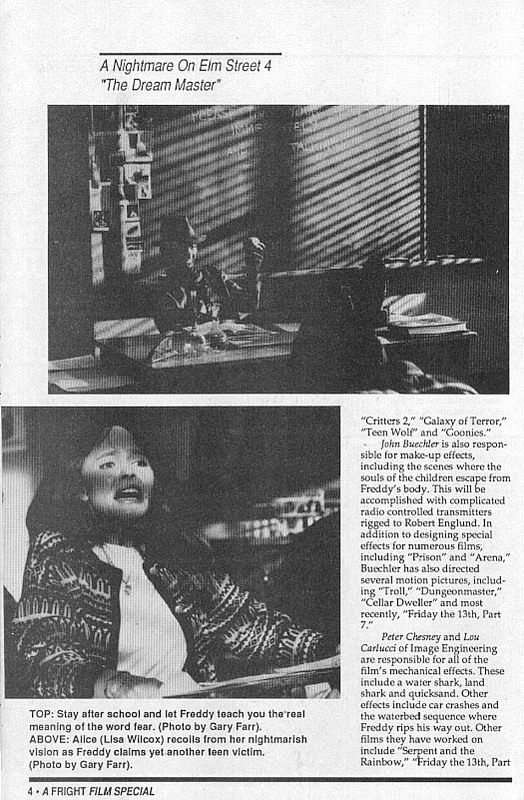 Before forming New Line Cinema in 1967, Shaye wrote, produced, directed and edited a number of short films, trailers and TV commercials. He was the producer /director of two award-winning short films, “Image” and “On Fighting Witches,” both of which were acquired for the permanent collections of the Museum of Modern Art and the British Film Institute. Since founding New Line, Shaye has overseen the acquisition, sales and production of more than 150 feature films for New Line. At the same time Shaye has acted as producer or executive producer on several other films, including “Stunts,” “Alone in the Dark,” “The First Time,” “Polyester,” and all of the “Nightmare on Elm Street” movies. 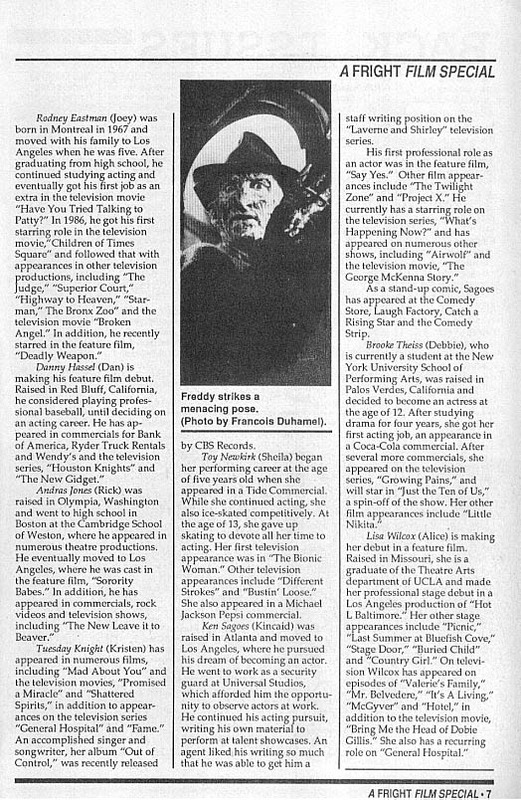 His acquisitions for New Line Cinema include “Get Out Your Handkerchiefs,” winner of the 1978 Best Foreign Film Oscar,” Lina Wertmuller’s “The Seduction of Mimi” and the box office smash by Tobe Hooper, ‘The Texas Chainsaw Massacre.” He received a B.B.A from the University of Michigan School of Business Administration and an L.L. B. from Columbia Law School. Shaye was also selected as a Fulbright Scholar in the field of copyright Jaw and is presently a member of the New York Bar. Sara Risher (Executive Producer) began her career in the film industry working for Jack Valenti at the Motion Picture Association of America and later was assistant to producerIdirector Peter Yates. In 1974, she joined New Line Cinema and since then has been involved in the production of all the company’s films, including “Stunts,” ‘The First Time,” “Alone in the Dark,” all of the “Nightmare on Elm Street” films, and “Critters.” She is currently President of New Line Cinema Corp.
Stephen Diener (Executive Producer) is president and chief executive officer of Heron Communications, Inc., the entertainment arm of Heron International. He also serves as chairman of Media Home Entertainment, a Heron Communications, Inc. company. With more than 15 years worldwide entertainment industry experience, he has also served as president of CBS/Fox Video International. Prior to his video industry experience, Diener was a senior executive in the recording industry, serving as president of CBS Records International and president of ABC Records. Tuesday Knight (Kristen) has appeared in numerous films, including “Mad About You” and the television movies, “Promised a Miracle” and “Shattered Spirits,” in addition to appearances on the television series “General Hospital” and “Fame.” An accomplished singer and songwriter, her album “Out of Control,” was recently released by CBS Records. Toy Newkirk (Sheila) began her performing career at the age of five years old when she appeared in a Tide Commercial. While she continued acting, she also ice-skated competitively. At the age of 13, she gave up skating to devote all her time to acting. Her first television appearance was in ”The Bionic Woman.” Other television appearances include ”Different Strokes” and “Bustin’ Loose.” She also appeared in a Michael Jackson Pepsi commercial. Ken Sagoes (Kincaid) was raised in Atlanta and moved to Los Angeles, where he pursued his dream of becoming an actor. He went to work as a security guard at Universal Studios, which afforded him the opportunity to observe actors at work. He continued his acting pursuit, writing his own material to perform at talent showcases. An agent liked his writing so much that he was able to get him a staff writing position on the “Laverne and Shirley” television series. His first professional role as an actor was in the feature film, “Say Yes.” Other film appearances include “The Twilight Zone” and ”Project X.” He currently has a starring role on the television series, “What’s Happening Now?” and has appeared on numerous other shows, including “Airwolf” and the television movie, ”The George McKenna Story.” As a stand-up comic, Sagoes has appeared at the Comedy Store, Laugh Factory, Catch a Rising Star and the Comedy Strip.